The 2018 Mercedes-Maybach S650 will be the first offering from the German automaker to carry the Euro-VI compliant petrol engine in India. Mercedes-Maybach India had been targeting the Auto Expos specifically to launch their new offerings. Last year we saw the armoured version of the extended wheelbase living room on wheels. Right before the armoured version, came in the Maybach S500 and S600. The former is being locally assembled in India while the latter is being imported as a completely built unit. Mercedes-Maybach marks the epitome of luxury for the German brand as the luxury limousines are based on the extended S-class platform and offers its passengers more luxury and comfort features than one can imagine. 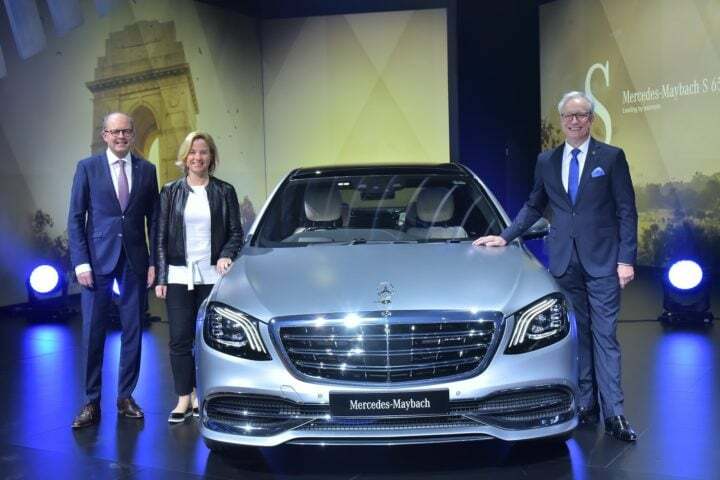 Mercedes launched the latest Maybach S650 in India at the ongoing 2018 Auto Expo. Along with the S650, Mercedes also launched the Maybach S560. While the new Mercedes Maybach S650 replaces the S600, the other two remain to be offered alongside. The new Maybach S650 is priced at INR 2.73 Crore ex-showroom India. The new S560 variants will cost its customers a base sum of INR 1.94 Crore ex-showroom India. The updated for 2018 Mercedes Maybach S650 features a more aggressive design in-line with the AMG series. The bumper gets an aggressive diffuser and the car grows 1 mm in width as well. The exterior features all-around LED lighting with the front headlamps featuring new triple-torch Multibeam design with Ultra Range high beam. The tail lights feature a new crystal-like design that appears more premium than the one it replaces. The 19-inch alloy wheels are now replaced by 20-inch ones as the new S650 now features Magic Body Control that enables the car to use radar and camera-based technology to scan the road ahead and automatically adjust the suspension on each wheel individually. Magic Sky Control is also offered on the new S650 that allows the passengers to adjust the transparency of the panoramic sunroof with a mere push of a button. Under the hood of the new 2018 Mercedes Maybach S650 is a massive V12 engine that churns out a whopping 630 hp of max power and 1000 Nm of torque. The engine comes mated to the 7G-TRONIC automatic gearbox. This engine also marks the entry of the first Euro-VI compliant engine in India. Starting this April, Euro-VI compliant fuel will be available in the nation’s capital with the rest of the nation following soon. Stay tuned for more info on upcoming Mercedes cars.